A Card For My Mommy! I had lots of time to stamp today so I took advantage of that! It was nice to be able to sit down without worrying about something else interrupting me. The only thing I had to worry about was when to change out the laundry! I made this card for my mom! I miss her so much and I bought this sentiment from Hobby Lobby with her in mind! 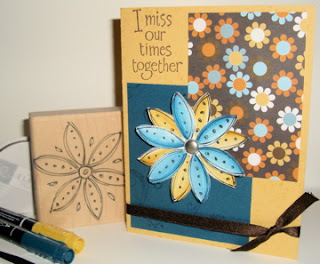 I followed this weeks SCS sketch challenge #165 with this card. I struggled a little with it. I couldn't decide if I liked the colors or not. I like how it turned out though and I hope she likes it as well! 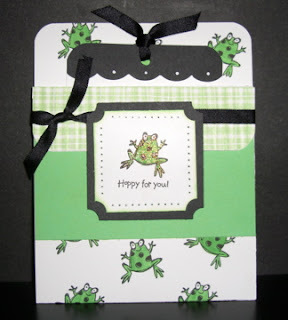 My First Thursday Sketch Challenge AND Baby Card! Well, I made a baby card like I said I would, but this isn't for the friend I mentioned earlier! I have another friend who just found out she was pregnant so I am going to send her this gender neutral card to congratulate her! :D She actually got married AFTER Nick and I did so it was quite the surprise to hear she was pregnant! I am excited for them though! 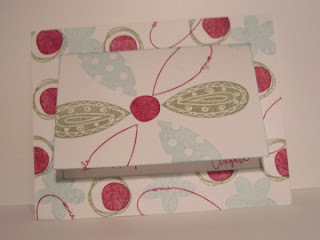 I also decided to try the Thursday Sketch Challenge on Lindsay's blog. She has such a great blog! Make sure to check her stuff out. She makes my stuff look pathetic! Hehe. I am pretty pleased with how this card turned out. This is literally the only baby stamp that I have so I had to make it work. The crib image is from the SU! set Very Punny and the sentiment is a stamp I got from Hobby Lobby. I thought it fit perfectly with the image though! 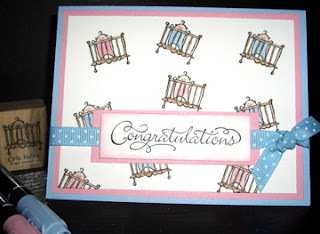 I colored in the baby with Stampin' Write Markers and I sponged the edge of the sentiment piece with Pretty in Pink. It was very easy to make. In fact, I think it took less time than any other card I have made, believe it or not. I hope you enjoy it! Good evening ladies! I told you I wouldn't have time to stamp tonight (which stinks)! After school Nick and I had to run some errands. We then made dinner and before we knew it we had to be at the church for youth group! My goodness my Wednesdays are busy! They are actually worse than my Mondays! Anyway, I just thought I would give you another glimpse into my life. As promised, here is a card that I received for my birthday (back in October) from my good friend and teaching partner, Leanne. Leanne is actually the one I hold responsible for my stamping addiction. I love her for it though! :D She is an awesome SU! demonstrator so if you need one just let me know and I'll get ya hooked up with her! Anyway, back to the card. 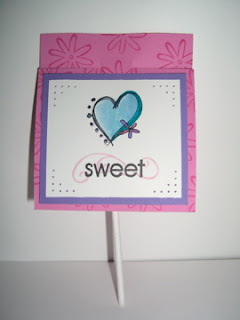 I love the colors and layout that she choose for this card. It is quick and simple yet so cute! Leanne, if you are reading this...THANKS! You are the best! :D Make sure to check out her SCS Gallery. She's very talented! Well, we didn't have Bible Study tonight because my co-leader went into labor! :D I guess that means I will be posting a baby card soon. Hehe! I am excited! Anyway, since the boys still had their Bible Study tonight I hid out in my stamping room. I got 4 cards made though! It was quite exciting. I made these cards for my husband's and my grandparents. We put together albums for them and I made some cards to go with them! I wasn't sure what to do at first because I had honestly never made a card for someone older. I really like how they turned out though. I kept the layout the same for the most part, but played around with my ribbon choice and the sentiment. I wasn't sure if I liked the sentiment and my husband said he liked it better without so I just decided to leave it off of 3 of them. Let me know which card you like the best. I just can't decide! :D I suppose that's not a bad thing. Thanks again for stopping by! You girls are the best! Here is another card that I made today. This one took more time because it was my first pocket card. I used the tutorial from the resources page of SCS! This card was a lot of fun to make. I knew I wanted to use another one of my new stamps but it took me forever to figure out which one! I finally decided to go with this cute frog! He is another favorite of mine! I struggled making this card too and was getting frustrated. 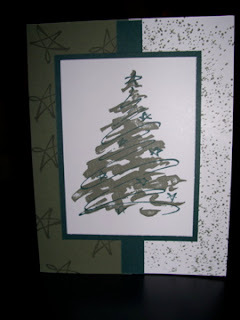 Luckily there are no mistakes in stamping (or you just cover them up with paper)! Haha. I wasn't originally going to put the big piece of green card stock on the front of my pocket but I am actually really glad I did! I think it adds a lot of dimension. Well, I am going to head for bed! It is WAY too late! Enjoy! Alright, as promised I have some cards for you. We had a great time with our friends tonight so it is later than I expected! :D I still had time to get some stamping done when I got home though. My husband is actually preaching tomorrow morning at church so he is preparing. I figured, what better time than now? I just don't like going to bed without him! Anyway, here is one of the cards. I really like this card. I have had one of those nights when everything seems to go wrong and I was getting frustrated but felt so much better when I saw my end results! I decided to use my brand new SU! Very Punny set that I won. I just adore the images! They are so versatile and fun! I can't decide which stamp is my favorite. This is definitely one of them though! I also got to use lots of my new stuff! I hope you enjoy it! Alright, it's been forever since I have posted a card on here and I apologize. I PROMISE that I will have something to show you tonight so check back later. I would do it now but I have to go to dinner with some friends! I will post again SOON! Yay! I got TWO packages in the mail today! Could I be any happier? :D First of all I want to say "Thank you, thank you, thank you!" to Cindy for the AMAZING blog candy! Make sure to check out her blog. She is extremely talented! This is the first blog candy that I have ever won and I wanted it SO bad. I had literally been searching for this stamp set everywhere and then I won it! 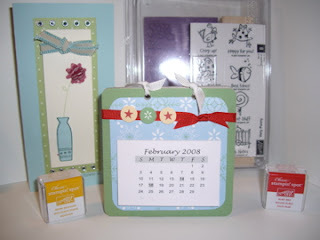 I also LOVE the card and calendar that she made. They are adorable. The calendar is definitely going to be sitting on my new desk! I am so excited! As if you couldn't tell. Hehe. The second package that I received in the mail was the stuff that I ordered off of Scrapbookpal.com. The shipping was incredibly fast (literally 2 days...they shipped it 10 min. after I ordered it...not exaggerating) and the shipping was FREE! I couldn't believe it! I would highly suggest ordering from them because they have awesome prices and their customer service is (obviously) impeccable. I honestly couldn't find the prices lower anywhere and trust me, I checked. 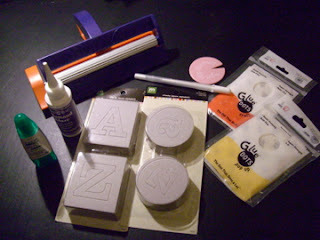 The tombow glue is a must have for stampers. It works just like the two way glue pen only, in my opinion, it's even more versatile. I had also been dying to get a paper crimper, so I did. Oh, by the way, the edge distresser was free! Obviously it was a good shopping experience and I would highly recommend them. Like the title of this blog says, I didn't get the opportunity to stamp today. My Monday's are just insane. I have school, meetings after school, hardly enough time to get dinner ready, and then I'm off to Bible Study until 9:30. It kind of stinks but oh well. I love my Bible Study girls and we usually end up talking for hours. Anyway, after an incredibly crazy day, I was so looking forward to coming home to see if the stuff I ordered had arrived and then I realized...it's President's Day. BUMMER! I even said that out loud when I remembered! Haha. Oh well, I think this is God's way of teaching me patience! :D Hopefully it will be here tomorrow. If it is I will definitely take some pictures for you! Oh, good news (for me). I am starting to tutor two girls this week, tomorrow actually, so I will be bringing in some extra cash that will hopefully be able to go towards my stamping (I hope that didn't sound selfish...). I will probably have to use it to help pay for bills first, but at least it will be extra cash we didn't plan on having when we set our budget! Tutoring pays well by the way. If you ever get the chance, do it! I will let you know how it goes. I am a little nervous about it. I am so used to my 2nd graders and these girls are in 4th! Haha. Hopefully I can handle it. ;) Well, that's all for tonight. Thanks for stopping by even though I had nothing to share! Well, today I made Valentine's for my Bible Study girls (a little late). I was going to make them last week but since it took so long for me to get my SU! order I had to wait until this week. It's alright though because they will still mean the same! :D I got the idea for these cute sucker holders from Dawn who has been such an inspiration to me! She has tons of great tutorials and her stuff is amazing! If you haven't checked out her blog before, DO IT! You won't be disappointed, I promise! I also got the idea for my 2nd grader's Valentine's from her as well! :D I had never tried watercoloring before until I made these so it was definitely a learning experience. I had fun making them though and really like how they turned out. I kind of had to improvise since I don't have any Valentine stamps but it works! Let me know what you think! Thanks so much for stopping by! Have a GREAT week! I really do! My hubby and I get to spend the entire day together and we don't have to worry about work! It's lovely. Well, I made another card but I kind of feel like it is missing something. I just couldn't figure out what. I got to use all of my new goodies with this card so it was exciting. 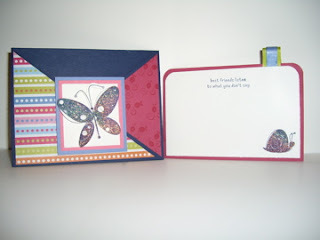 I used my ticket corner punch, my Garden Whimsy stamp set, and my iridescent embossing powder! It was very exciting! :D I can already tell that this set is my new favorite! I hope you like it! I also wanted to let you all know that hubby started working on my new stamping area today! He has actually been working on it ALL DAY! I am excited. In honor of today's milestone I wanted to post a picture of the area that I have currently. It's not horrible. I just hate searching for what I want. I just recently got the cube and folders for all of my paper. That has definitely made my life easier! I also just recently added the UGLY little black stand next to the table. It too has helped because now I have more room to actually work! I am very excited to have more room to work and a much sturdier table (can you see it sagging in the middle?)! Yay! I received this adorable card in the mail today! It is from my good friend Megan whom I haven't seen in FOREVER! I miss her very much so I was THRILLED to hear from her! I just love how the actual card part is on the front! I also really like the colors that she chose. It is just so cute! She used the "Pick a Petal" SU! stamp set (which I don't have yet and absolutely love)! You can check out her blog here: www.megkeith.wordpress.com. Thanks Megan! You are so sweet! Again, sorry about the horrible lighting! Well, I haven't had a lot of opportunity to stamp this week. It has been one hectic week. It's the end of the trimester for us so that means I have lots of tests to grade and report cards to work on. I also have parent/teacher conferences next week and I need to get everything ready for those! However, to make my week wonderful, I did FINALLY get my new stuff yesterday so I found some time to stamp late last night! Here is the card that I decided to make. I wasn't exactly sure about it at first but my hubby likes it so I suppose it can't be TOO bad! :D The lighting is pretty horrible so the picture didn't turn out that great. I'll have to try taking another one. I need to learn to take a picture of my cards when the sun is still up! 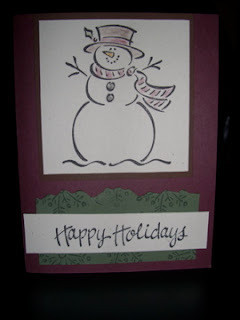 The card was actually pretty easy to make, I just took forever in deciding what I wanted the colors and layout to be! That's me and my indecisiveness though! 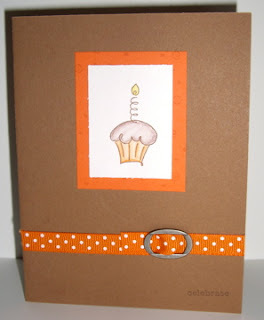 As a side note, I should be getting my new Stampin' Up order tomorrow! Yay! I seriously get so excited about stuff like that! My dh thinks I'm ridiculous. He is probably right. Haha! However, once I told him about SAB he said "Well get all of your orders in NOW so that you can get lots of free stamps!" I didn't mind that thought one little bit! :) So...looks like I'll be placing a new order soon! I look forward to being able to make different things! I am still needing to make Valentine treats for my Bible Study girls. Hopefully I can get on that SOON! Enjoy! I can't believe it is already Saturday night! I feel like yesterday was Thursday. I guess that's what happens when you have a busy weekend. My dh and I spent almost the entire day in Colorado Springs today. We had so many errands to run. I didn't mind it though because I went to Hobby Lobby AND Michaels! Woo Hoo! Nick got a little bored but that's alright. I had 2 40% off coupons at Hobby Lobby so I was able to get a Crop-a-Dile, and some white ink. Some things that I have really been needing. Also, ribbon was half off so I got LOTS of it! :D To top it all off, my husband now wants to build me a desk/shelving system to organize my area! He is SO excited about it. It's all he could talk about on the way home. I love a man who can work with his hands! ;) He's really good with wood working so I am excited to see what he comes up with! Well, since my day was so hectic I didn't get any stamping done so I will just have to post another card that I made a while back. I made this card for a good friend of mine. 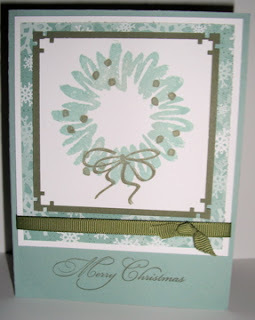 It was before I had any colored ribbon so I had to use Stampin' Pastels on white ribbon. I actually like how it turned out though. It's not the best picture. Sorry. Today my husband turned the big 25! I was really struggling with ideas for his card since I have very few materials to work with so I got out what I had and just started playing. I love what I came up with! I figured that while I was at it I might as well participate in Beate's weekend sketch challenge too. I don't have any actual SU! card stock yet but I do have some SU! ink and card stock that kind of matched. I just started looking for colors that would look good together and tried matching them with the ink and as a result I found some pretty close matches! I then found some brads that I had and some ribbon which made perfect embellishments! I have a Happy Birthday stamp that I got at Hobby Lobby a little while back and the circle stamp is from the SU! 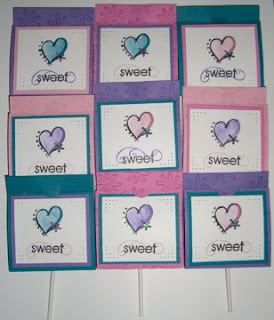 Sweet Shapes stamp set. The colors I used were Summer Sun, Old Olive, and Brocade Blue. I never would have imagined those colors could work so well together! Anyway, here is the final result! Let me know what you think. Thanks for looking! 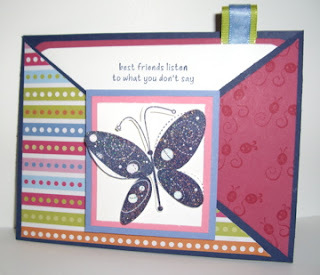 Since I am still fairly new to the stamping trade, I am really short on materials. I have found that it is very difficult to make a "good" card without the proper gear. 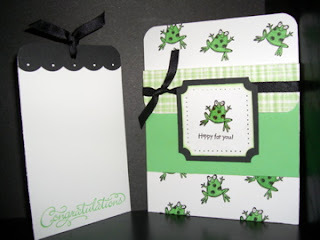 That is why I just placed a rather large order with Stampin' Up! Now, I am so anxious to get the stuff and my distributer (who is also my teaching partner) has informed me that it hasn't even been shipped yet (mainly due to the fact that they are swamped with SAB, which is understandable). :( I was so hoping I would have it by Friday because that is my day off and my dh is at work. I also need to make him a b-day card. His birthday is FRIDAY! YIKES! I am just so excited to get my new stuff that I can't stand it. I need to do some serious stamping! 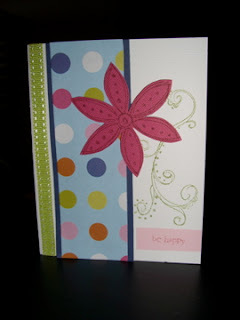 On another note, since I can't exactly make a card right now, here is one that I made at a card party. 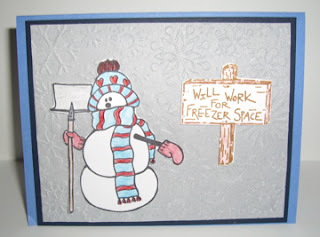 It is a very appropriate card for right now since we have been getting so much snow lately! 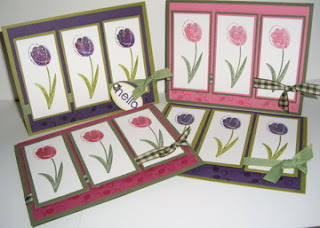 I love the set that we used and I LOVED learning how to emboss. Well, thanks for checking it out! I hope you all have a great night. I am off to bed! My teaching partner and I made these cute Valentines for our 2nd graders! I got this fun idea from Dawn's blog. Make sure to check it out! We know that they will love them. We went with the very cute Wild About You stamp set because we knew the kids would love the fun animals. For our colors we choose SU! Pixie Pink and Green Galore card stock and ink. 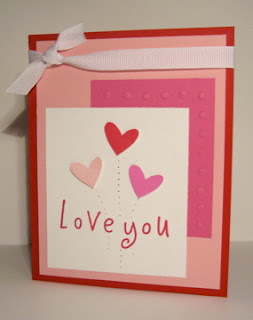 To make the Valentines we took a piece of card stock that was 8 1/2 x 4" and scored it at 3" and at 6 1/4". We used the SU! slit punch to hold the bags of sweet tarts in and ribbon to secure the bottom flap shut. They were very simple to make and we had a blast doing it! Yay! My own blog spot! I finally decided to get my own blog site where I can showcase all of the cards I make and just ramble about life. I actually am just starting to stamp but it is an addiction already! 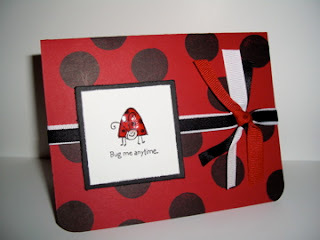 I love creating cards! My husband is just glad that I have finally found a hobby! Hopefully you will hear more from me SOON! Thanks for checking it out!